This Great Gray Owl was the highlight of the trip this past Saturday. Rob and I have been birding for almost a decade now, and sometimes we forget what it's like to be "newbies". Please don't get me wrong, we are in no way experts, but we have picked up a bit of knowledge over the past ten years, and we are just learning how rewarding it can be to share that knowledge with others. 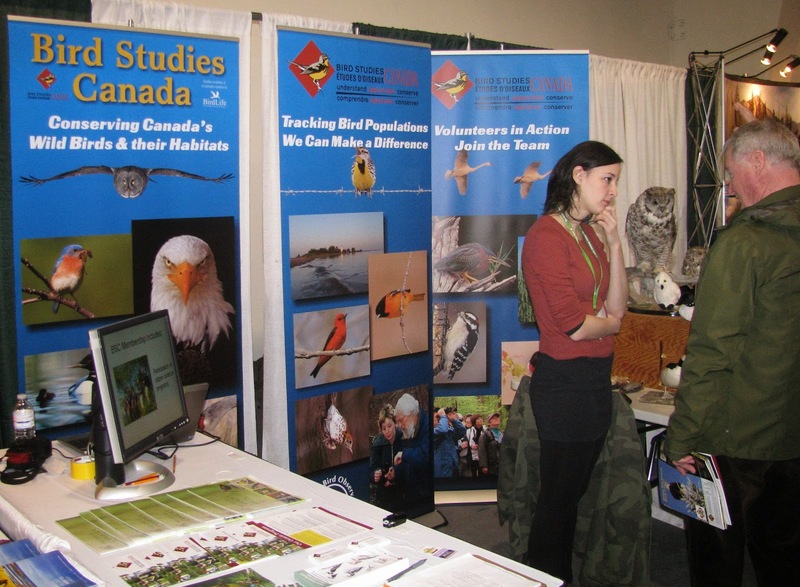 A couple of weeks ago we both volunteered at the Bird Studies Canada booth at the "Outdoor Adventure Show". 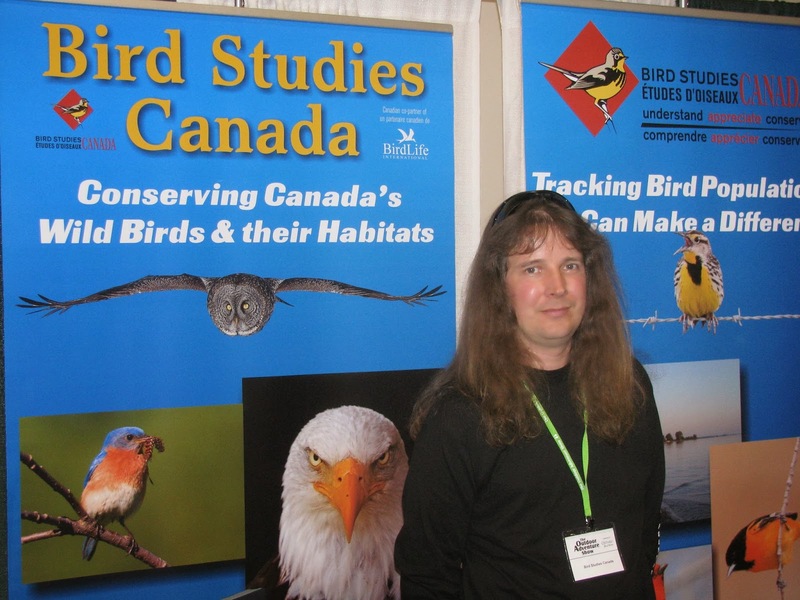 We talked nothing but birds and the various programs run by BSC for 4 hours straight! It was awesome! I know more about birds than I thought I did! I told Emily, the organizer, that we'd do an 8 hour shift next year! Rob waiting to share his knowledge. Emily in deep conversation about birds. 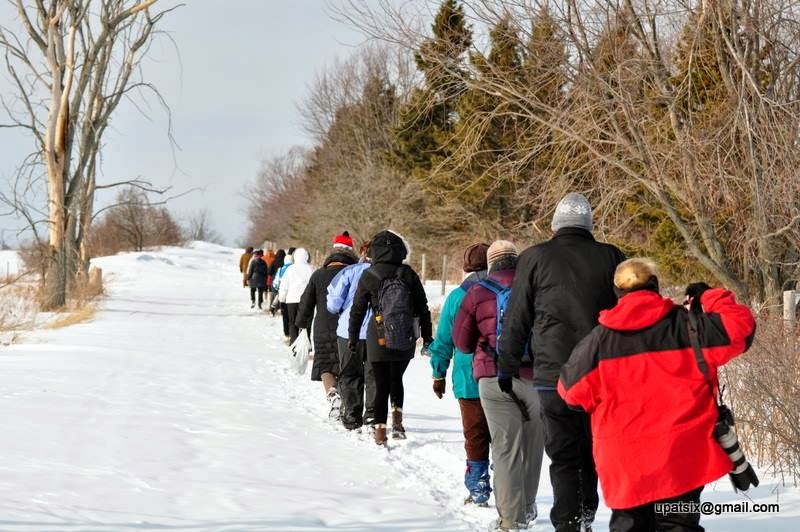 This past Saturday we went on a "Toronto Nature Lovers" trip to Amherst Island. We've been there a few times with the group and it's always a good trip. You never know what to expect, and we sure weren't disappointed on this trip. Some in the group were very experienced birders, while others were very new. It was a good feeling to share some bird seed so people could hand feed Chickadees for the first time. It was enjoyable for me to explain the difference between Hairy and Downy Woodpeckers, and how to tell the difference between the sexes. There is so much to learn when it comes to birding, I still have plenty to learn, but it felt to good to share what I know. We had quite the walk into Owl Woods. The road wasn't plowed and up to my knees in places, but what we experienced when we got there made it all worth it. The "fellowship" walking to Owl Woods. Photo by Jim Psilhogies. I have never found an owl on my own in my years of birding. 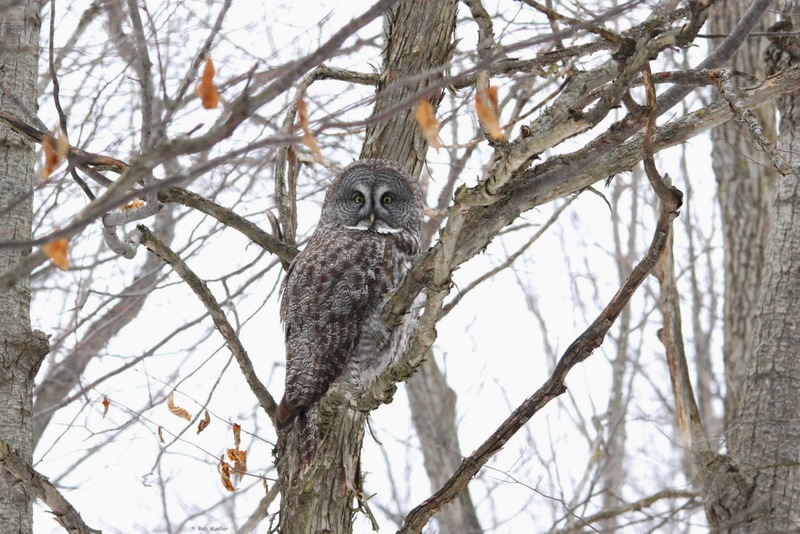 Jo-Anne, not only spotted the beautiful Great Gray Owl, but it was her first wild owl ever! Way to go Jo-Anne! A couple of people were not able to do the walk in, it was a tough one, so the next sighting we had after leaving Owl Woods was all the more special. 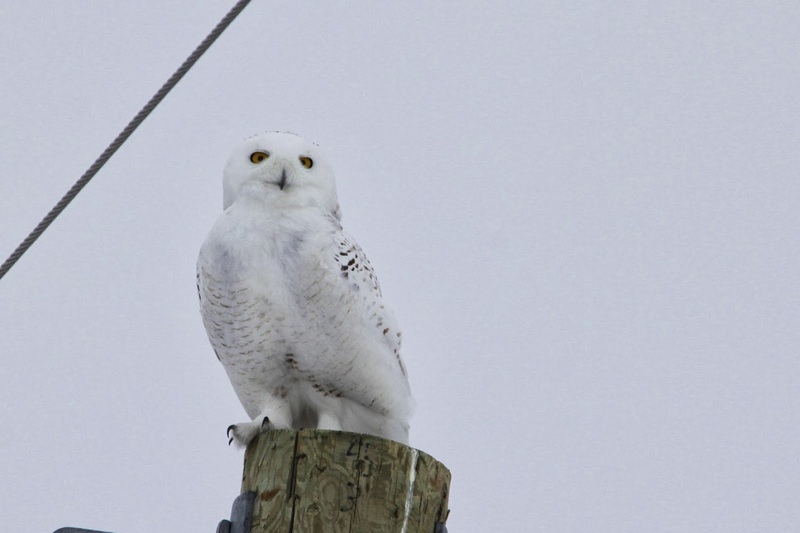 A gorgeous male Snowy Owl put on quite the flying show for us! 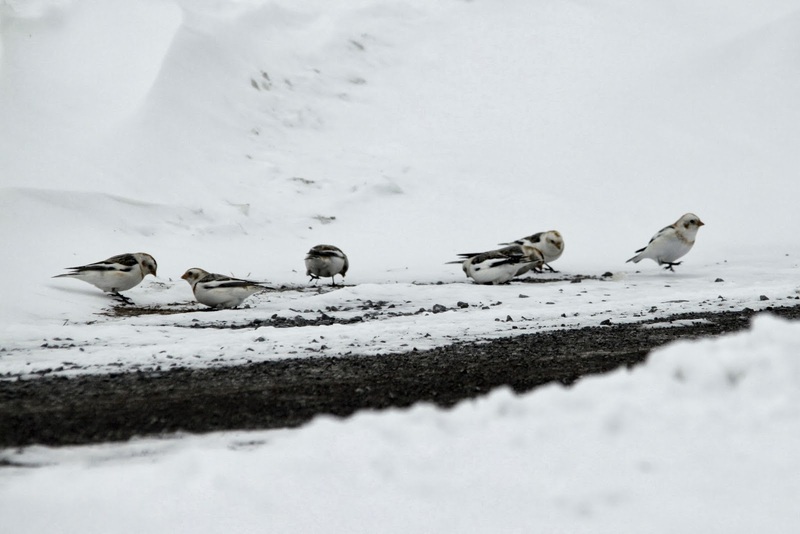 I was THRILLED to see some Snow Buntings! First time this winter. It was a great and memorable day with a great group of people, and I look forward to our next trip. This was Rob's and mines second Great Gray Owl. Our first sighting was in Oct. 2012, and came courtesy of Lev Frid. You can read all about that adventure here. It's one of my favorite blog posts. Lev and I after making the return trip from Owl Woods. Lev was my first exciting sighting of the day, in the parking lot before we left, I didn't know he was joining us, a surprise from Murray. Read the other blog to understand why I have such fondness for him. He payed it forward in a big way to Rob and I, and we will never forget it. 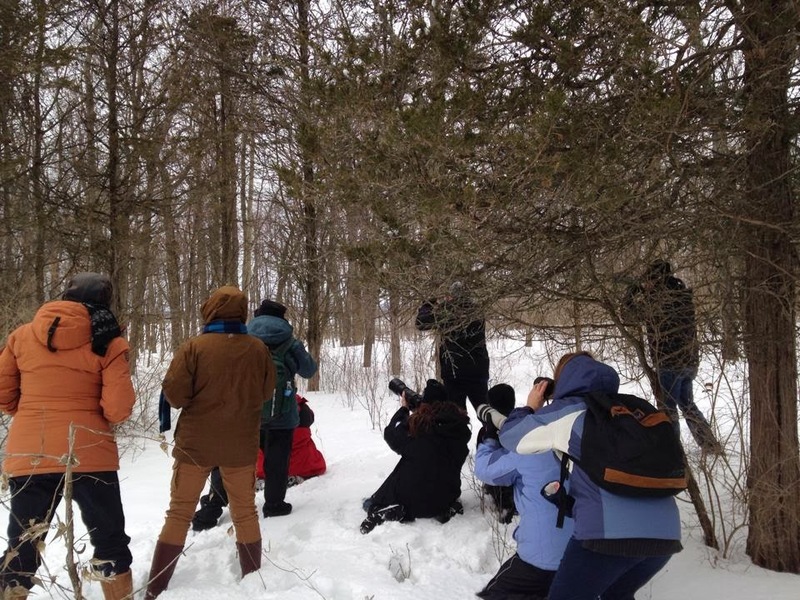 You can find Toronto Nature Lovers on Facebook and Meetup. Looks like an awesome day, Angie! And good on you for sharing your experience. I joined up with a birding group down here and wasn't made to feel welcome at all. Most of them wouldn't talk to me. :D … won't be doing that again. It looks like you guys have access to some really special events up there. It looks like so much fun.